Musical theatre historian Doug Reside recounts the mind-bending task of trying to assemble a Rent archive from Jonathan Larson's old MS Word files. 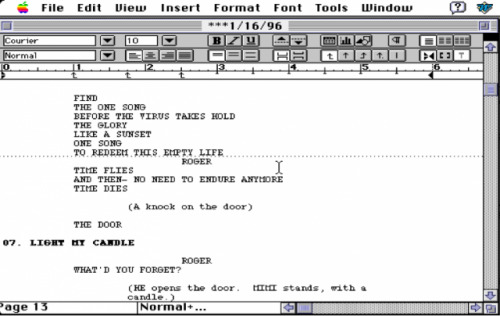 The final draft of RENT on Larson's disks was saved at 12:38 PM on Monday, January 15 using a copy of Microsoft Word 5.1 for the Macintosh. Opening this file with a vintage copy of the software, it's possible to see the file more or less as Larson saw it in 1996....When I open the same file with a simple text editor like Text Wrangler, though, the text appears to be somewhat different. In the picture below, you can see the line "Before the virus takes hold" appears as "Before you enter the light." But I'm looking at the same file! What's going on? It turns out early versions of Microsft Word had a setting called "fast save" to speed up the frequent action of writing to a file (a slow process in those days of floppy disks and computers that ran only about 2% as fast as today’s iPhones). "Fast save" worked by appending revisions to the end of a file rather than completely overwriting the existing the text. Word 5.1 knew to look for these revisions and integrate them into the main text when the file was opened. A text editor, on the other hand, just opens the text as it finds it. His bigger point (from an earlier post) is that you dramatists out there need to start thinking about when you're famous and get smart about your backup software! Today, researchers at NYPL can read the music manuscripts of Gustav Mahler a century after they were written. However, unless today's artists and libraries work together to find ways of preserving the digital drafts, emails, even Facebook accounts that now represent most of the contemporary creative and social record, there will be a gaping hole in our cultural history a century from now.